In November and December 2017, Sadie Coles HQ presents an exhibition of drawings and collages. The display will focus on collage both as a literal process of joining together and disjoining, and as a compositional mode. The works in made on the table range from mixed media compositions and found-object assemblages to drawings in which juxtaposition and dissonance are guiding ideas. 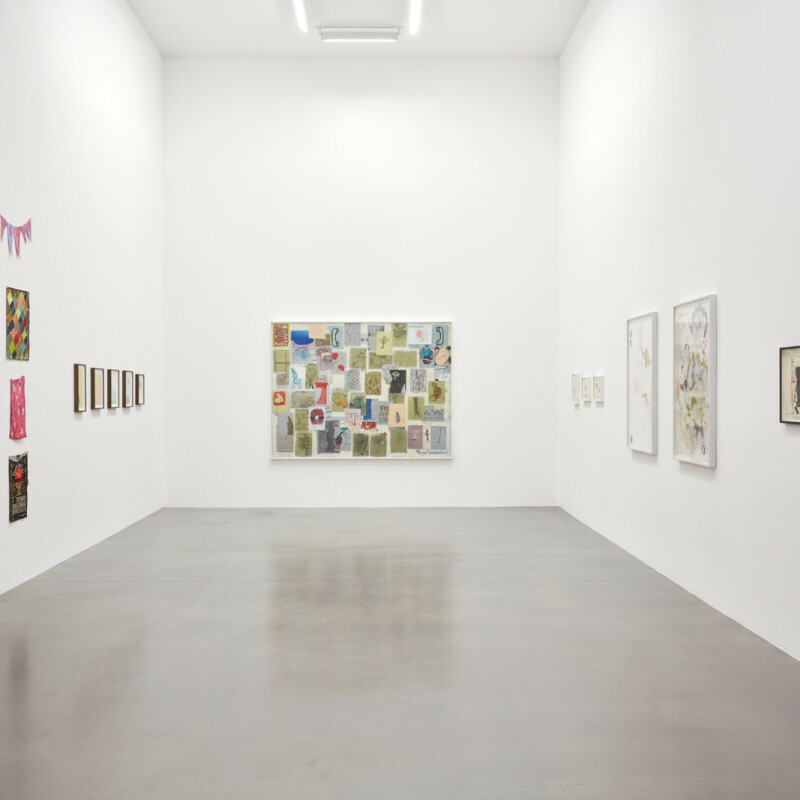 Urs Fischer’s Living on the Phone (1998) is a sprawling montage of small-scale drawings and paintings on paper, affixed to a white-painted mount and framed behind glass. The stacked and overlapping pages mass together to form a symbolist anthology of Fischer’s early concerns – from morphing bodies to pictograms teetering on the brink of abstraction. Two telephones are rendered, on separate pages, as graphic black-painted handsets – suggesting the twin ‘receiving ends’ of a manic and fluid dialogue of forms. Other pages contain sketches – made variously in watercolour, pencil, coffee and sugar – depicting cartoon-like anatomies, spirals, brick walls and other architectonic or organic structures. In a series of early works on paper by Laura Owens, formal and stylistic categories are simultaneously contrasted and conflated through simple, sparing acts of juxtaposition. One work from 1998 shows a photograph of an abstract painting collaged within a loosely sketched, minimally perspectival ‘room’. This image of a picture within a picture collapses together photographic and painterly registers, and abstract and representational modes, anticipating the generic blurrings of Owens’s larger-scale works. In two groups of early works by Richard Prince and Raymond Pettibon, found texts and images are set in ironic or allusive dialogue. In a body of drawings from the late 1990s and early 2000s, Prince combines pop-cultural references (grafted from the beat, hippie, pulp and punk eras) with Modernist motifs such as the heavy-limbed figures of Picasso’s ‘classical period’. Untitled (Hippie Drawing) presents a hybrid figure whose finely-shaded head and ‘timeless’ (yet slightly cross-eyed) gaze are in marked contrast with its bulbous, rapidly-outlined arms – raised in a gesture of peace. In Untitled (1999), another delicately-toned visage floats in the style of an imagist ‘poetic fragment’ beside two totemic stick figures which recall the graffitied bodies of Jean-Michel Basquiat. In Pettibon’s drawings from the 1980s, ‘found’ fragments of text are combined with cartoon-style drawings. The drawings and their accompanying ‘captions’ (often transposed from sources such as textbooks) echo the format of cartoons while producing an overriding sense of ambiguity or dislocation. Often, the caption or ‘thought bubble’ throws the image off-kilter. As critic Robert Storr has observed, these early works “tell bits and pieces of several stories at a time”. This idea of simultaneous fragmentation and condensation is reflected in a number of more recent works. In a series of wall pieces, Uri Aran has integrated found objects into dense systems of marks and motifs, poised between relief sculpture and abstract painting. Collage becomes a way of mediating between the appropriated and the handmade, as well as between ‘logic’ and ‘sensation’. These antitheses and contrasts may also be glimpsed in a new group of drawings of Helen Marten, in which ornamental scrolls, borders and flourishes – redolent of antique playing cards – are offset by more disorderly and unresolved compressions of imagery. Moments of precise and lyrical line drawing may give way to sudden ‘ruptures’ in style and import, akin to the irrational disjunctions of dreams. Many of the works in the show demonstrate how collage borrows from, and thereby comments on, the ‘real world’ – often achieving a subtle kind of political or personal commentary. In Adriano Costa’s wall pieces, everyday materials – many of them drawn from his life – are assembled into semi-abstract compositions. Reality is reconstituted into poetic fragments while retaining a sense of the undifferentiated ‘stuff’ of life, mass produced and ephemeral. In a number of works, scraps of fabric are sewn and pasted together into makeshift word pieces, alternately lyrical and banal. made on the table focuses on artists whose works bring together (or prise apart) images, texts and objects – mediating between ‘part’ and ‘whole’, narrative sequence and condensed time. In many cases, provisionality is an end in itself. The emphasis throughout the display is on the small-scale, the handmade and the contingent. These qualities are reflected not only in literal examples of collage and montage, but also in works where ‘collage’ is a way of thinking rather than a physical procedure. In its breadth and variety, the exhibition itself aims at a ‘collage aesthetic’ of simultaneous collision and correspondence. Uri Aran (b. 1977, Jerusalem) lives and works in New York. He graduated from Columbia University in 2007, and has since exhibited internationally, with solo presentations including Uri Aran: Time for an Early Mark, curated by Moritz Wesseler as part of ‘curated by vienna 2017’, Christine König Galerie, Vienna; Two Things About Suffering, Sadie Coles HQ, London (2016); Mice, Koelnischer Kunstverein, Cologne, Germany (2016); Puddles, Peep-Hole, Milan (2014); Five Minutes Before, South London Gallery (2013); and here, here and here, Kunsthalle Zürich (2013). He has been included in group exhibitions including 99 Cents or Less, Museum of Contemporary Art Detroit, Detroit, USA (2017); Question the Wall Itself, Walker Art Center, Minneapolis, USA (2016); Take Me (I'm Yours), Jewish Museum, New York (2016); Walter Benjamin: Exilic Archive, Tel Aviv Museum of Art, Israel (2016); do it, various international venues (2013-15); Liverpool Biennial 2014; the 2014 Whitney Biennial, Whitney Museum of American Art, New York; and The Encyclopedic Palace, 55th Venice Biennale, Venice (2013). Adriano Costa (b. 1975, São Paulo) lives and works in São Paulo, Brazil. Solo exhibitions include ChapéuFilosófico – a show about LOVE LOST LET IT GO OR AS U WISH, Múrias Centeno, Lisbon, Portugal (2017); Touch me I am geometrically sensitive, Sadie Coles HQ, London (2014); and La Commedia dell’Arte, Peep-Hole, Milan, Italy (2014). Group exhibitions include Under the Same Sun: Art From Latin America Today, South London Gallery (2016; on tour from Fundación Jumex Arte Contemporáneo, Mexico City); What separates us, Embassy of Brazil in London, London (curated by HS Projects) (2016); Kiti Ka’aeté, The Modern Institute, Glasgow, Scotland (2015); IMAGINE BRAZIL, Astrup Fearnley Museet, Oslo & Musee D’Art Contemporain de Lyon, France (2014); Correspondências, Centro Cultural dos Correios, Rio de Janeiro (2013); and Time Space Poker Face, Be-Part, Waregem, Belgium, 2013. Urs Fischer (b. 1973, Switzerland) lives in New York. Recent solo exhibitions include Big Clay #4 and Two Tuscan Men, Piazza della Signoria, Florence, Italy (2017); Urs Fischer: The Public & the Private, Legion of Honor, San Francisco, USA (2017); All Ages, Fondation Vincent van Gogh, Arles, France (2016); Small Axe, Garage Museum of Contemporary Art, Moscow (2016); False Friends, Musée d'Art et d’Histoire, Geneva (2016); a survey exhibition at MOCA, Los Angeles (2013); Madame Fisscher, Palazzo Grassi, Venice, Italy (2012); and Skinny Sunrise, Kunsthalle Wien, Vienna (2012). He has had solo shows throughout Europe and the USA, including Oscar the Grouch, The Brant Foundation, Greenwich (CT) (2010) and Marguerite de Ponty, New Museum, New York (2009). In 2004, Not My House Not My Fire took place at Espace 315, Centre Pompidou, Paris, and the retrospective Kir Royal was held at Kunsthaus Zürich, Switzerland. Urs Fischer’s work has been included in numerous group exhibitions including the Venice Biennale in 2003, 2007, and 2011. Helen Marten (b. 1985, Macclesfield, UK) lives and works in London. She studied at The Ruskin School, University of Oxford (2008) and Central Saint Martin’s College of Art and Design (2005). Marten was the winner of the 2016 Turner Prize, and the inaugural 2016 Hepworth Prize for Sculpture. Solo exhibitions include Drunk Brown House, Serpentine Sackler Gallery, London (2016); Parrot Problems, Fridericianum, Kassel, Germany; Oreo St. James, Sadie Coles HQ, London (all 2014); No borders in a wok that can’t be crossed, CCS Bard Hessel Museum, Annandale-on-Hudson (NY), USA (2013); Plank Salad, Chisenhale Gallery, London; Evian Disease, Palais de Tokyo, Paris; Almost the exact shape of Florida, Kunsthalle Zürich, Zürich, Switzerland (all 2012); Take a stick and make it sharp, Johann König, Berlin (2011); Wicked patterns, T293, Naples, Italy (2010). Group exhibitions include Second Nature, K11 Art Foundation, Chi Art Space, Hong Kong (2017); New Sculpture, The Whitworth, Manchester, UK (2017); The future is already here – it’s just not evenly distributed, 20th Biennale of Sydney, Australia (2016); and All the World’s Futures, 56th International Art Exhibition, Venice Biennale, Venice, Italy (2015). Marten was the recipient of the LUMA Prize (2012); Prix Lafayette (2011) and The Boise Travel Scholarship (2009). Laura Owens (b. 1970, Euclid, Ohio) lives and works in Los Angeles. She studied at the Rhode Island School of Design, the Skowhegan School of Painting and Sculpture, and the California Institute of Arts. Currently the subject of a major mid-career retrospective at the Whitney Museum of American Art (NY), recent solo exhibitions include: Sadie Coles HQ, London; Ten Paintings, CCA Wattis Institute, San Francisco (CA) (both 2016); Secession, Vienna (2015); 12 Paintings by Laura Owens and Ooga Booga #2, 356 S. Mission Road, Los Angeles (2013); Pavement Karaoke / Alphabet, Sadie Coles HQ, London (2012); Kunstmusem Bonn, Germany (2012); Bonnefantenmuseum, Maastricht, Netherlands (2007); Kunsthalle Zürich, Zürich, Switzerland (2006); and the Museum of Contemporary Art, Los Angeles, (2003) – an exhibition which travelled to Aspen Art Museum, Milwaukee Art Museum and the Museum of Contemporary Art, North Miami. Raymond Pettibon (b. 1957, Tuscon, Arizona) studied at UCLA in Los Angeles. As a young graduate he worked as a maths teacher before embarking on an artistic career, designing album covers for Black Flag and becoming associated with the Los Angeles punk scene. In recent years, Pettibon has had numerous solo shows including The Cloud of Misreading, Garage Museum of Contemporary Art, Moscow (2017); A Pen of All Work, New Museum, New York (travelling to the Bonnefantenmuseum, Maastricht, The Netherlands) (2017); Homo Americanus, Deichtorhallen Hamburg, Falkenberg Collection, Hamburg, Germany (touring to the Museum der Moderne Salzburg, Salzburg, Austria) (2016); Home and Away. Raymond Pettibon: Living the American Dream. Marko Mäetamm: Feel at Home, Kumu Kunstimuuseum, Tallinn, Estonia (2015); Whuytuyp, Kunstmuseum Luzern, Lucerne, Switzerland (2012); Raymond Pettibon, Kestner Gesellschaft, Hanover, Germany (2007); Whatever It is You’re Looking for You Won’t Find It Here, Kunsthalle Wien, Vienna, Austria (2006); and Raymond Pettibon, Whitney Museum of American Art, New York (2005). The survey exhibition Homo Americanus is currently on view at Deichtorhallen Hamburg - Sammlung Falckenberg in Hamburg, Germany. Retrospectives of his work have been held at the Philadelphia Museum of Art, the Santa Monica Museum of Art, and the Museum of Contemporary Art, Los Angeles. In 2010 Pettibon received the prestigious Oskar Kokoschka prize. Raymond Pettibon lives and works in New York. Richard Prince (b. 1949, Panama Canal Zone) had his first solo museum show in 1983 at the Institute of Contemporary Art in London, and has since had numerous solo exhibitions internationally. These include It’s a Free Concert, Kunsthaus Bregenz, Bregenz, Austria (2014); Prince/Picasso, Museo Picasso Málaga, Spain (2012); Richard Prince. American Prayer, Bibliothèque Nationale de France, Paris (2011); Continuation at the Serpentine Gallery, London (2008), and Richard Prince: Spiritual America at the Solomon R. Guggenheim Museum, New York (2008).